Moving right along in the Anne series, I picked up Rilla of Ingleside which has long been thought to be the last book in the series. 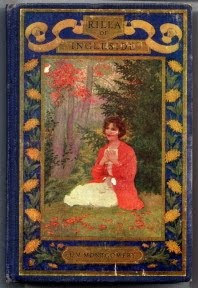 However, thanks to Penguin Canada we now know that Montgomery wrote what she intended to be a ninth book in the Anne series - The Blythes Are Quoted . I've just recently finished that title and will have a review of it popping up shortly. In the meantime - Rilla. Rilla of Ingleside was first published in 1921 and jumps us about a decade(ish) beyond Rainbow Valley (linked to my review.) Montgomery chose to focus primarily on Rilla, who is the youngest child and daughter of Anne and Gilbert Blythe. This story is set in World War I - and if you have (dared to) watch Anne of Green Gables: The Continuing Story (not linked because I hate it) then the story line will be familiar to you. The Continuing Story places Gilbert and Anne in World War I, sending Gilbert off to fight. Anne adopts a war baby and nothing realistic happens. A great deal of that movie script was ripped from Montgomery's story of Rilla. Rilla of Ingleside does have great historical relevancy that goes beyond just being another of Montgomery's novels. It is one of the only books that was written right after the first World War that gave a description of life on the Canadian home front. It tells the story of Rilla as she and her family experienced the challenges of war - both the joys and the heartaches. Rilla is merely a fanciful teen at the beginning of this book but as the war continues on, and she rises to meet and stare down the challenges which are presented to her, she grows into a mature young woman whom the reader ends up very much admiring. In my latest story, “Rilla of Ingleside,” I have tried, as far as in me lies, to depict the fine and splendid way in which the girls of Canada reacted to the Great War – their bravery, patience and self-sacrifice. The book is theirs in a sense in which none of my other books have been: for my other books were written for anyone who might like to read them: but “Rilla” was written for the girls of the great young land I love, whose destiny it will be their duty and privilege to shape and share. Unlike Rainbow Valley, Anne and Gilbert receive quite a bit more "air time" - primarily because it is their offspring who are now being sent off into battle. We are able to feel the effects of the war through the eyes of sacrificial parents who allow their children to go off and fight for freedom. In fact, quite admirably, Gilbert and Anne affirm their young lads in their pursuit of bravery and duty in order to secure the freedom of Canadians and other oppressed peoples. "It is the beginning of the end - I feel it - I feel it," said Mrs. Blythe. "Thank God," said Susan, folding her trembling old hands. Then she added, under her breath, "But it won't bring our boys back." Nevertheless she went out and ran up the flag, for the first time since the fall of Jerusalem. As it caught in the breeze and swelled gallantly out above her, Susan lifted her hand and saluted it, as she had seen Shirley do. "We've all given something to keep you flying," she said. "Four hundred thousand of our boys gone overseas - fifty thousand of them killed. But you are worth it!" The wind whipped her grey hair about her face and the gingham apron that shrouded her from head to foot was cut on lines of economy, not of grace; yet, somehow, just then Susan made an imposing figure. She was one of the women - courageous, unquailing, patient, heroic - who had made victory possible. In her, they all saluted the symbol for which their dearest had fought. Something of this was in the doctor's mind as he watched her through the door. Indeed it seems to me that it is Susan who carries the family through their most trying times. She is a faithful friend and I say this sincerely - God knows that when you are in your most trying times, it is the blessing of a constant friend and support system that will help carry you through. Susan Baker is that to the Blythe family and I found myself wanting to share an afternoon with her above all the other characters in the book. She is amusing and has some fabulous quirks, 'that you may tie to.' But above all she has a loyal heart of gold and I find her most admirable. At the risk of making this too long, I'll stop here and say that I am very happy to have re-read this particular title. I can't believe I waited so long from my last reading to get to it again! I'll try not to make the same mistake again. May I make a shameful confession? Do I really want to? Well, I really want to skip Anne of Ingleside and get to the next book...then this! It is taking me SO LONG to read it! Rilla of Ingleside is one of my favorites ... though I could say that about the whole series. I really enjoy seeing WWI from the perspective of the Canadian homefront. It's been ages since I read it -- I am looking forward to getting back to it eventually. I'd forgotten much of what it was about. Rilla of Ingleside is the book that most captured by imagination, but that's a blog post for another day. Really--there was/is another book? I never knew. . . How did I miss this? Next to the early books in this series, Rilla is one of my favorites. You've made me want to go back and re-read it again. :-) Looking forward to your review of The Blythes are Quoted. I ordered it from Amazon but they cancelled my order and I was never able to get my hands on a copy. Alison - same thing happened to me. (Highly disappointing!) I finally ordered it through Amazon.ca and just paid for the shipping to get it here. Rilla has become one of my favorite "Anne" books besides Anne of Green Gables. I wonder though if age has a lot to do with it. When I was younger I think a lot in this book went right over my head, but after having kids and learning more history it really left an impression on me. Yes! I love to read about you reading about Anne et al! I remember reading this one and bawling. It's been a long time since I've read any of them... now it's hard for me to get through the first one... the incessant talking that Anne does! ;) I am so not a talker that it's hard for me! These later Anne books sound really fun. I'll have to remember to read these next year. I absolutely loved this book when I read it in high school. I will never forget the way I felt when I finished it. I loved Rilla's character--maybe I could identify with her. I was in love with someone in high school--I mean I had a crush--and I remember realizing after reading this book that I did and I needed to admit it to myself. I was the incurable romantic back then. Whatever happened to that girl?? This is my very favorite book by LM Montgomery. It is a war story, and it is so very, very personal, and so real. I cry every time I read it. Sheesh, I almost cried reading your quote. I think it edges out even Anne of Green Gables as her very, very best.